My dear Aficionados, for MB Cigars Ladies, this time we meet Tia. Let’s read about her. I am Tia Calhoun (Cigar Goddess) which the name was picked because my first name in Greek means Goddess so it just felt appropriate. I have been in the cigar business for 7 years now and I love every minute of it. I am a co-host of a local cigar TV talk show that comes on every Tuesday night at 7:30pm on channel WMCN. My co-host are a great group of guys that I work with Rob Pascucci, Scott Ackinson, Arthur Toll, and Paul Magier. Cigars are a major part of my life and every day I am learning something new about them that I did not know the day before. 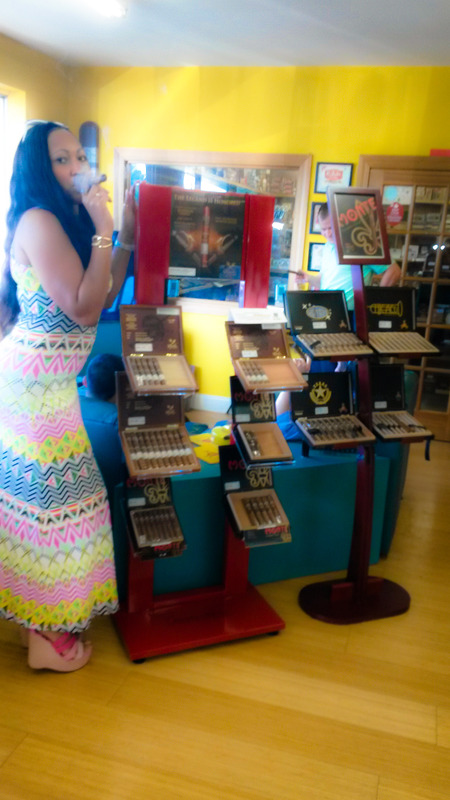 I host many cigar events with my company and I am always available to host any cigar event. I started smoking at 24 years old when I was approached to managed a cigar lounge. The owner felt I had a lot of potential to not only manage one of his lounges but be a powerful female presence in a male dominated industry. Once I started at the lounge I had my first cigar which was a CAO Soprano Limited Edition and needless to say it was very powerful and kind of made me not want to smoke anymore but once I learned not to smoke a full-bodied when you are beginner, I switched to milder cigars and began loving cigars ever since. I smoke between 1 to 3 cigars a day depending on my mood or if there is a cigar rep coming in and they have a new product out and I want to try it. Well of course I have to say Cigar Cigars all 9 lounges in Pennsylvania because that is where I work and spend most of my time smoking but I do like to go out to a lounge that allows smoking and have a drink with my cigar. I use a Bullet cutter on all of my cigars. I like the bullet cut because it makes a smaller hole which controls how much smoke comes out of the cigar and I feel you get less tobacco in your mouth as well. Some people have disagreed with me on the tobacco in your mouth part but this why I love cigars because its all based on your own opinion and your own preference. When I’m smoking a cigar I feel very relaxed and at peace. I can concentrate better on what ever it is I am doing while I am smoking. I like to play with the smoke in my mouth before releasing it, swirling it around my tongue to the roof of my mouth and then exhaling very slowly. I light my first cigar around 10 am and if I have more than one a day I light the last one always by 4 pm. Not exactly sure why but it always works out that way. I love smoking a Culebra cigar which is actually made by Villiger. 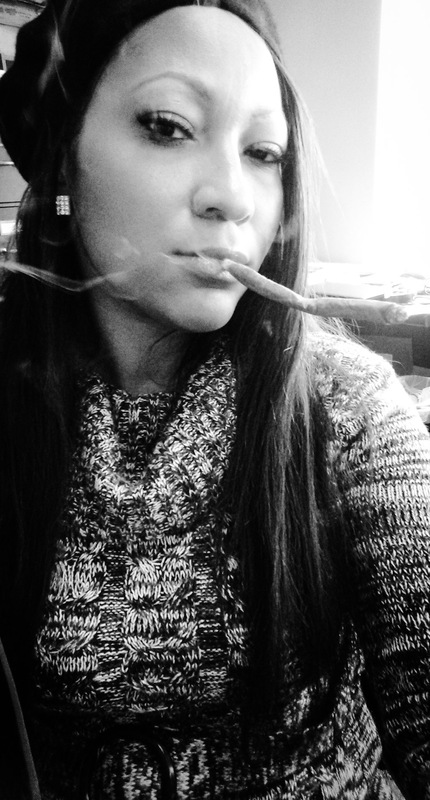 It is an old style cigar with 3 Panatela’s wrapped together kind of resembling a snake hence the name Culebra. It has a tip at the end which sits nice against my lips and it is very mild and creamy and helps me get my day started right. Thank you very much, Tia, for the time you spent for us. Good ashes. 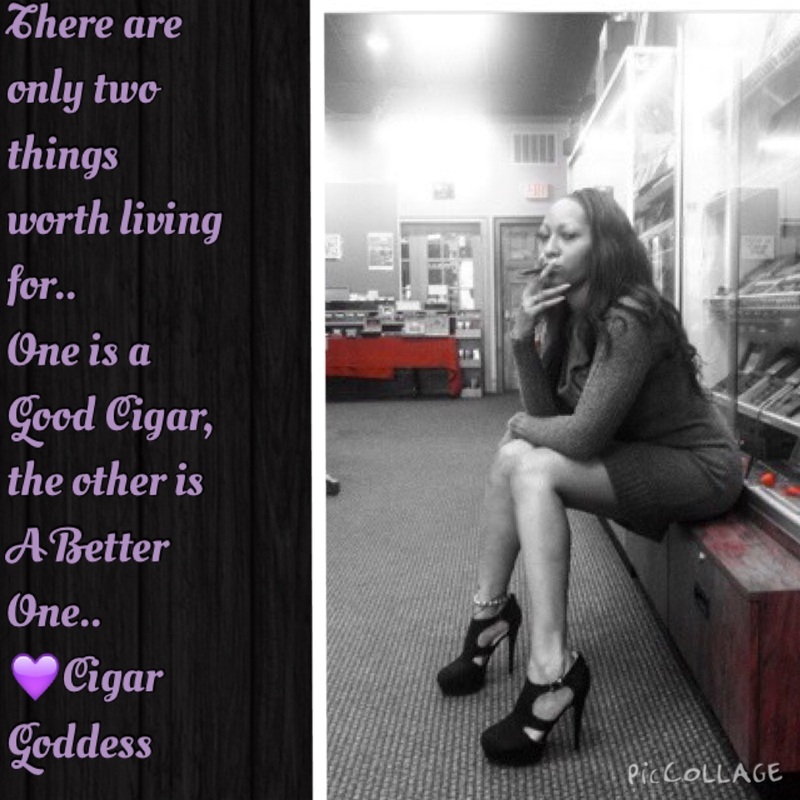 3 Responses to "“Tia Calhoun„"
I enjoy watching cigar time and I finally found your section on MB Cigar Ladies. I am a lover of Fine Art and must say you are a true masterpiece. Keep up the good works. I enjoy watching cigar time and I think you do an excellent job as one of the panelist. Keep up the good work.